Eugene Khoza was born in Pretoria and is no taller than a mic stand. Eugene Khoza said he always felt out when he entered the comedy circuit. Eugene Khoza quotes: “The other comedians had jobs, fancy cars, they were acting on TV; I have always felt like the outsider. I wasn’t going to the cool parties in the right car, I never went to private school and I wasn’t living in Johannesburg. I had to talk about me, my relationships, casual dating and never fitting in. I never felt like I was lying when I was telling those stories”. Eugene Khoza started performing at the Horror Café Comedy Night and eventually hosting it. Eugene Khoza did this for a year. 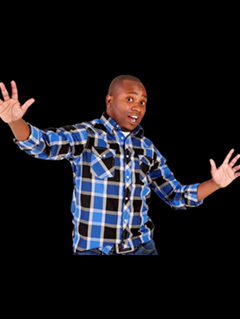 Eugene Khoza made the semi-finals at the Laugh Out Loud comedy competition and won the Ricoffy Comedy Challenge in the same year. This started Eugene Khoza on his way up the ranks of becoming a great comedian. Eugene Khoza was the host with Trevor Noah on the e.tv reality competition The AXE Sweet Life in 2009. Eugene Khoza is also a television presenter known for co-hosting the SABC1 show Countdown 2010.